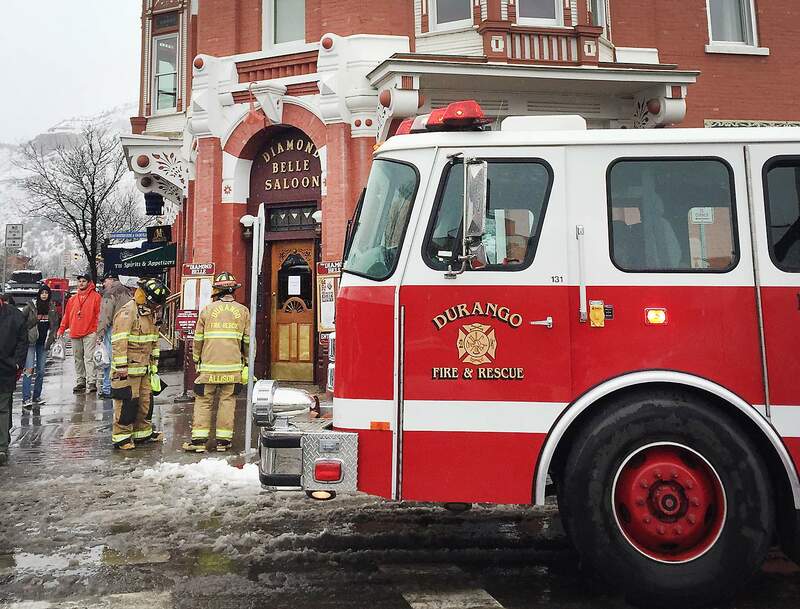 Durango Fire Protection District firefighters responded to a small fire Friday afternoon at the Strater Hotel. The fire was contained to a light fixture in the ceiling of the Diamond Belle Saloon. Firefighters are investigating an electrical fire that started Friday afternoon in a light fixture at the historic Strater Hotel in Durango. The 12:20 p.m. fire was contained to the light fixture and did not impact the structure, said Rod Allen, battalion chief for Durango Fire Protection District. Smoke was seen coming from a junction box that services a chandelier hanging in the Diamond Belle Saloon, which is part of the Strater Hotel, 699 Main Ave., said owner Rod Barker. The Diamond Belle was closed while firefighters investigated but was scheduled to reopen Friday night. Power to the restaurant was turned off while firefighters investigated. Barker said the hotel takes fire mitigation seriously.